1940 Disney released its animated feature film masterpiece Pinocchio (1940) - one of the best examples of the studio's animation talent. This was Disney's second feature-length animated film, following after Snow White and the Seven Dwarfs (1937). It. won two Oscars, one for Best Score and one for Best Song ("When You Wish Upon a Star"). 1940 Disney's groundbreaking Fantasia (1940), an outgrowth of the "Silly Symphony" series, was comprised of classical music pieces and matching animation. It introduced a "Fantasound" 'stereo-like', multi-channel soundtrack (an optical 'surround-sound' soundtrack printed on a separate 35mm reel from the actual video portion of the film). It cost about four times more than an average live-action picture. The film received a special certificate at the 1941 Academy Awards for its revolutionary Fantasound (early stereo or 'surround-sound'). 1940 The first of the seven Bob Hope-Bing Crosby/Dorothy Lamour "Road" films (spanning 1940-1962) was released: Paramount's Road to Singapore (1940). The original pairing was to be with Jack Oakey and Fred MacMurray, in a film called Road to Mandalay. 1940 The Thief of Bagdad (1940) was the first move to use the 'blue-screen' (chroma-key process) technique. It was notable as the first film not nominated for Best Picture to win at least three Academy Awards: Best Special Effects, Best Art Direction (Color), and Best Cinematography (Color). 1940 "King of the Cowboys" Tom Mix, the first major western film star, died at the age of 60, in a freakish car accident in Arizona. Traveling at a high speed, he suddenly braked to avoid a construction zone and his car rolled over - he was instantly killed by a large aluminum suitcase (placed behind him) that struck him in the head. 1940 In the sixth (and final) film in the Mr. Wong series from Monogram Pictures, Phantom of Chinatown (1940), Chinese-American actor Keye Luke took the role of the title character. This marked the first time an American film featured an Asian character as a lead Asian detective. In the previous five films in the series, Boris Karloff played the title character. 1940 Vaudeville and radio stars Abbott and Costello made their big-screen film debut in One Night in the Tropics (1940). However, the two comics were not the major stars of the film, but just minor contract players (they reprised some of their famous stage acts, including a rudimentary "Who's on First"). Their overwhelming popularity as a result of the film led to their own feature film with top billing in the following year - Buck Privates (1941). 1940 The musical Down Argentine Way (1940) featured the first starring role for Betty Grable. It also featured Don Ameche and Carmen Miranda in her US film debut. 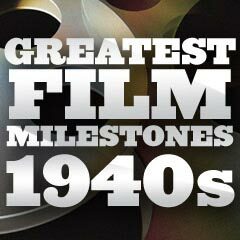 1940 The first agents began to assemble creative talent and stories in exchange for a percentage of the film's profits. 1940 Universal's 13-episode serial The Green Hornet (1940) starred Gordon Jones as the crusading, masked crime-fighting super-hero and billionaire vigilante (Britt Reid, aka Green Hornet, a modern-day 'Robin Hood') accompanied by his martial arts sidekick Kato. 1940 Alfred Hitchcock's first American film, Rebecca (1940), won Best Picture at the awards ceremony in 1941. It competed against another Hitchcock film, his second American film - Foreign Correspondent (1940). 1940 After the conclusion of the filming of Foreign Correspondent (1940) in late May 1940, and before the film's release, Hitchcock learned of the anticipated bombing of London (the Luftwaffe's blitzkrieg), so a new final scene was written (by Ben Hecht) and reshot. It was the propagandistic scene in a London radio station where Joel McCrea appealed to the US: "Hello, America! Hang on to your lights. They're the only lights left in the world." 1940 Director Frank Borzage's melodramatic anti-war MGM film The Mortal Storm (1940), was an anti-Nazi political expose of the hateful, totalitarian Reich's rise to power beginning in 1933 when Hitler became Chancellor. The controversial propagandistic film was one of the first of its kind from Hollywood (released a few months before Chaplin’s The Great Dictator (1940)). The strong anti-fascist and anti-Semite message of the anti-Nazi film caused it to be banned by the Aryan supremacist Nazis in Germany, led by Hitler's propaganda minister Joseph Goebbels. Although the film never mentioned the words Jew or Jewish (the term "non-Aryan" was used), the film so angered the Nazis that all of MGM's films were banned in Germany. 1940 John Ford directed The Grapes of Wrath (1940), his most famous black and white epic drama - the classic adaptation of John Steinbeck's 1940 Pulitzer Prize-winning, widely-read 1939 novel. This film was the most popular left-leaning, socialistic-themed film of pre-World War II Hollywood. 1940 Actor/director/producer/writer/composer Charlie Chaplin released his first "all-talking, all-sound" feature film, The Great Dictator (1940). Charlie Chaplin was the first to ever receive three simultaneous nominations, as producer, actor, and screenwriter for the film. Grossing about $5 million (domestic), it was the most successful film of his career. In the film, Chaplin "spoke" during his portrayal of Adenoid Hynkel, dictator of Tomania -- a satire on Adolf Hitler and his tyrannical rise to power. 1940 The Andy Panda animated short Knock Knock, produced by Walter Lantz, featured the first appearance of Woody Woodpecker, voiced by Mel Blanc. It was the first time that mischievous Woody's trademark laugh was heard. In a few years, Woody's design was softened (his buck-teeth, green tail, large chin and thick legs were eliminated or changed). 1940 Walter Brennan became the first performer to win three Academy Awards for acting with his win in 1940. He won Best Supporting Actor for his performances in alternating years, for Come and Get It (1936), Kentucky (1938), and The Westerner (1940). 1940 Famed cartoon character Bugs Bunny first said his famous non-chalant line ("What's up, Doc?" voiced by Mel Blanc) in his fourth cartoon - Tex Avery's Oscar-nominated A Wild Hare (1940) in the Merrie Melodies series from WB - the first and definitive or true Bugs Bunny cartoon, co-starring Elmer Fudd as a rabbit hunter (and noted for Elmer's first use of his 'wabbit' voice). Bugs finally received his identifiable name by his next cartoon, Elmer's Pet Rabbit (1941). 1940 Many sources have claimed that director Boris Ingster's Stranger on the Third Floor was the first full-featured film noir. It starred Peter Lorre as the sinister 'stranger' (cast due to his creepy performance in M (1931)), in a story about the nightmarish after-effects of circumstantial testimony. See also 1941. 1940 Howard Hawks' speedy and hysterically funny, modern-style screwball comedy His Girl Friday (1940), was one of the best examples of its kind in film history. Although it had a 92-minute running time, the breath-taking, fast-paced film had more than enough dialogue for a 3-hour movie. It was best remembered for its overlapping dialogue and simultaneous conversations - and it marked one of the earliest instances in which characters would deliberately (and realistically) talk over the lines of other characters. 1940 Director/scriptwriter Preston Sturges' political satire The Great McGinty (1940) was Sturges' directorial debut film. It was also noted for its Oscar-winning Best Original Screenplay. Sturges was the first Hollywood scriptwriter to direct his own work - and he was also the first director to win the Academy Award for his own original screenplay. It was the first time a film in Hollywood opened with the credit: "Written and Directed By." He was able to retain greater control over and exercise greater protection of his own creations, signaling the days when a writer could also be the director and/or producer.